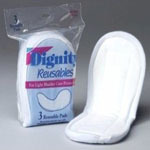 The lightweight reusable incontinent pad is ideal for both men and women. 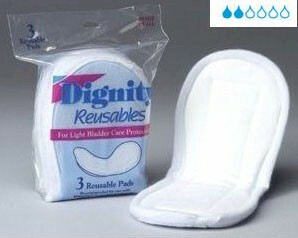 Can be used with both protective underwear or regular underwear. Machine wash and tumble dry warm cycle. Absorbent core is made from a poly/rayon blend and the barrier is made from a poly/vinyl knit. Pad measures 4 1/2" X 10 1/2". Comes 3 to a pack.